⚔ ☢ ⚓ Operation vejkryds. En serie på to amerikanske atomvåbenforsøg ved Bikini i Stillehavet under ledelse af Den amerikanske atomenergikommission / US Atomic Energy Commission. De første forsøg efter Trinity eksperimentet i juli 1945. The Joint Chiefs of Staff, Washington, D. C.
Your Board, appointed to evaluate the Bikini Atoll Atomic Bomb tests, has the honor to transmit to you its final report. Jeres bestyrelse, udpeget til at evaluere Bikini-atollens atombombeforsøg, har den ære, at sende Jer den endelige rapport. I overensstemmelse med vores direktiv er denne rapport klassificeret som top hemmelig. For at Fællesstaben af chefer kan offentliggøre denne rapport, har bestyrelsen udarbejdet en revision, hvorfra visse sager er blevet slettet. Forud for offentliggørelsen af denne revision vil det være nødvendigt at klassificeret faktuelt materiale blive slettet af den amerikanske militære overkommando', hedder det i indledningen til the Evaluation of the Atomic Bomb as a Military Weapon - the Final Report of the Joints Chiefs of Staff Evaluation Board for Operation Crossroads, 30 June 1947 Formålet med forsøgene var at undersøge effekten af atomvåben på orlogsfartøjer. BAKER eksplodere 27 meter under vandoverfladen den 24. juli. Det næste amerikanske atomvåbenforsøg var Operation Sandstone. USA's nationale radiologisk forsvarslaboratoriums dekontamineringscenter ved Hunters Point Naval Shipyard i San Francisco etableres i 1946 for skibe, der tidligere var involveret i atomvåben test i Stillehavet. Den 6. september 1946, nåede skibe fra Bikini-atollen som deltog i 'Operation Crossroads, frem til dette flådeværft, hvor radioaktiv maling skrabes af fra skibe i bugten af skibsværftsarbejderne. Dekontamineringsprojektet ophørte i 1969 og værftområdet er i dag stærkt forurenet. Se også: Atomfysik ; Atomvåbenuheld ; demon core. Se tillige: Operation Anvil ; Aqueduct ; Arbor ; Argus ; Bedrock ; Bowline ; Buster-Jangle ; Castle ; Chariot ; Charioteer ; Cornerstone ; Cresset ; Crosstie ; Cue ; Dominic ; Dominic II ; Dugout ; Emery ; Fishbowl ; Flintlock ; Fulcrum ; Fusileer ; Greenhouse ; Grenadier ; Grommet ; Guardian ; Hardtack I ; Hardtack II ; Ivy ; Julin ; Latchkey ; Little Feller ; Mandrel ; Musketeer ; Newsreel ; Niblick ; Nougat ; Phalanx ; Plowshare ; Plumbbob ; Praetorian ; Project 56 ; Project 57 ; Project 58 ; Project 58A ; Quicksilver ; Ranger ; Redwing ; Roller Coaster ; Sandstone ; Sculpin ; Storax ; Sunbeam ; Teapot ; Tinderbox ; Toggle ; Touchstone ; Trinity ; Tumbler-Snapper ; Upshot-Knothole ; Whetstone ; Wigwam. Arkiv: National Archives: Records of the Defense Threat Reduction Agency, (Record Group 374), 1943-73, herunder 'Letters, formal petitions, and other records relating to protests against the testing, 1946. Records of the Army Ground Group at Bikini, 1946'. First Pictures Atomic Blast!, 1946/07/08 (1946). 'The dramatic film history of the atom bomb test at Bikini! Pictures of the actual bomb drop! 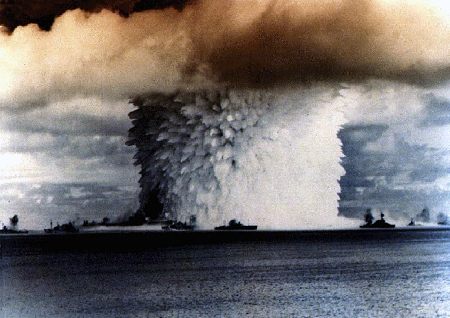 Blasted ships and the terrible destructive force of the world's fourth atom bomb! Universal Newsreel, in cooperation with the Army and Navy, presents the motion picture drama, 'Operation Crossroads.' This film record of the historical event shows in dramatic detail the various phases of the epochal experiment, from takeoff to the awful blast that destroyed or damaged more than half the ships in Bikini Lagoon." scenes of Admiral William H. Blandy commanding Operation Crossroads at Bikini Lagoon, test animals put on ships, sheep is sheared, Secretary of Navy Forrestal speaks on deck of ship (sound distorted), crews leave, Bikini fleet ready, A-bomb loaded on B-29 Dave's Dream, plane takes off, bomb doors open, men put on protective goggles; "The bomb's away! It's falling ... " then explosion, "motion picture spectacle of all time" and another view of the explosion. (complete newsreel)'. Mortality of Veteran Participants in the Crossroads Nuclear Test / J. Christopher Johnson, Susan Thaul, William F. Page, and Harriet Crawford, Editors; Committee on the CROSSROADS Nuclear Test, Institute of Medicine. 1996. National Park Service : The Archeology of the Atomic Bomb - A Submerged Cultural Resources Assessment of the Sunken Fleet of Operation Crossroads at Bikini and Kwajalein Atoll Lagoons (1991). Operation Crossroads (Part I) (1946). Operations Crossroads Underway, 1946/07/01 (1946). United States. Joint Task Force One; Shurcliff, William A.: Bombs at Bikini; the official report of Operation Crossroads (1947). Treasure Island Naval Station : Historical Radiological Assessment. - Vallejo, California : Weston Solutions, Inc. - 2006. - 250 pp. Trouble in Paradise: Postwar History of San Francisco’s Hunters Point Neighborhood : An Honors Thesis in Urban Studies, Stanford University / Submitted by Kelsey Finch. May 19, 2008. - 65 pp. United States. Joint Task Force One: Operation Crossroads, the official pictorial record (1946).